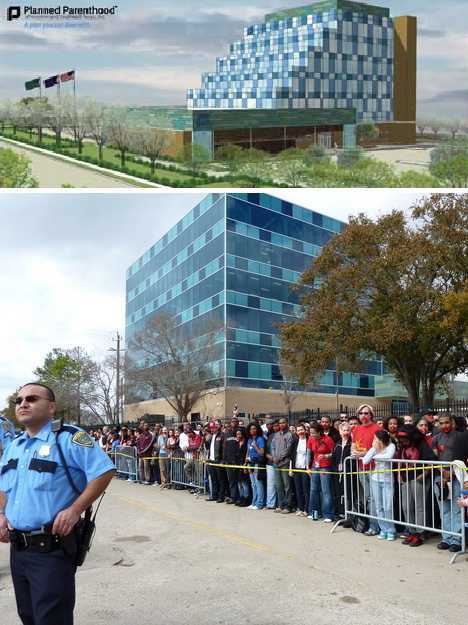 The issue of abortion continues to divide Americans but architects who design family planning clinics also face a delicate dilemma: how to make their buildings welcoming for patients yet at the same time, provide security for both staff and visitors? This pictorial post explores the various ways women’s health providers have attempted to make the best of a difficult situation. Women’s Health Care Services of Wichita, Kansas, was opened in 1975 by owner and official operator George Tiller MD. The clinic was one of only three family planning clinics in the country to terminate pregnancies after the 21st week. Tiller became a lightning-rod for protesters of so-called late term abortions and his clinic was the focus of longstanding demonstrations and rallies, most of which were organized by Operation Rescue. 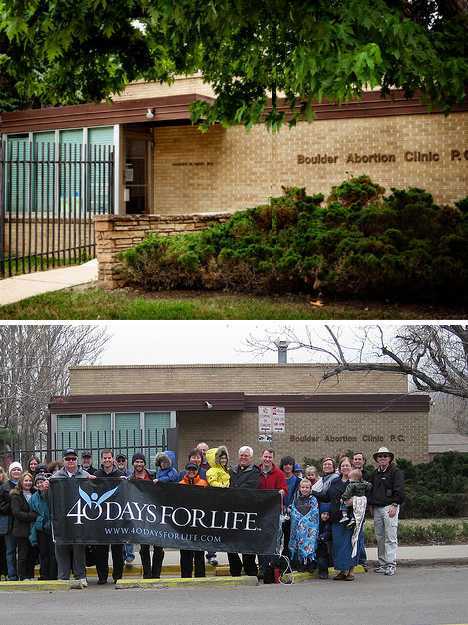 The building displays a bunker-like exterior augmented by wood slat privacy fencing, the latter often acting as a backdrop for banners, placards and bouquets of flowers left by members of pro-life movements. Women’s Health Care Services of Wichita was fire-bombed in 1986, though no staff members were injured and the damage was quickly repaired. In 1993 while in his car preparing to drive home from the clinic, Tiller was shot five times – though wounded, he returned to the clinic two days later. These attacks highlighted the fact that security has its limits in the face of the need for convenient public access. 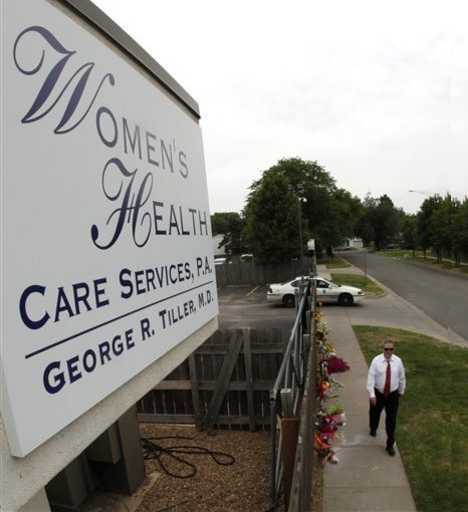 The Women’s Health Care Services clinic was officially closed on June 10th, 2009, following the shooting death of George Tiller at the Reformation Lutheran Church in Wichita on May 31st, 2009. 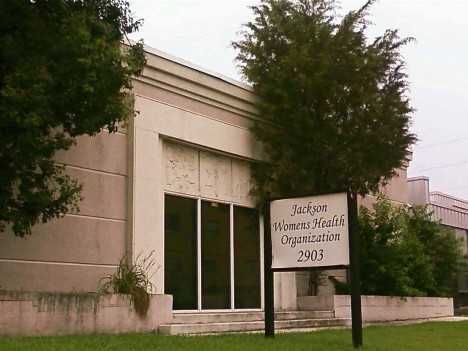 Formerly the National Women’s Health Organization, the Jackson Women’s Health Organization is the only licensed abortion practitioner in the state of Mississippi. The clinic’s design echoes that of hundreds of 1980s vintage plazas and strip malls with several exceptions: wrought iron fencing and concrete pillars that lend a somewhat fortress-like atmosphere. 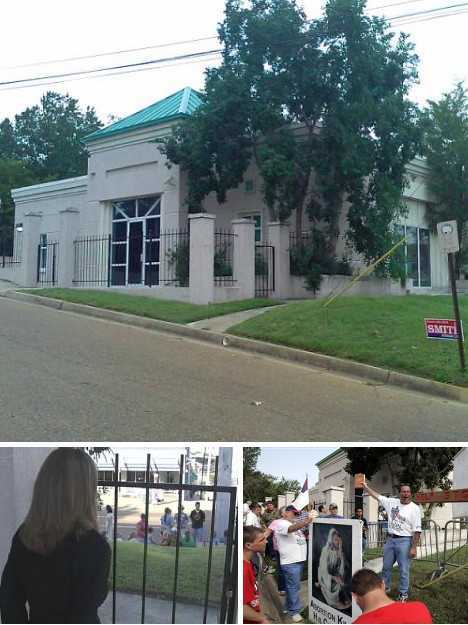 In the image above and at lower left, clinic director Nancy Kohsin-Kintigh can be seen looking out a window, through the fencing, at pro-life protesters gathering on the lawn. The Jackson Women’s Health Organization is not completely encircled by fencing though several mature trees provide discreet screening along with welcome shade from the Mississippi sun. As mentioned, the clinic is the only licensed abortion practitioner in the state (down from 8 in 1993) and as such has come under intense scrutiny from those who wish it shut down. Following the death of George Tiller in 2009, Dr. Warren Hern became the only physician in the country to perform late-term abortions. To quote brochures, Hern “specializes in late abortion for fetal disorders. Outpatient abortion over twenty-six menstrual weeks for selected patients with documented fetal anomaly, fetal demise, or medical indications.” Hern doesn’t shy from antagonizing opponents to his medical specialty, a fact that’s just as plain as the no-nonsense name of his clinic. The building itself is a squat, stand-alone structure dating from the late 1950s or early 1960s. Trees and shrubbery have been encouraged, and a tall wrought iron fence winds across the windowed front portion of the building, screening the glass from any directly-thrown missiles. 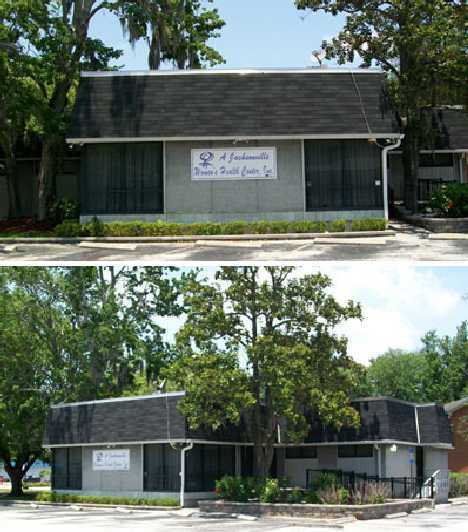 WomanCare, a family planning clinic located in the Suntree Plaza in Melbourne, Florida. Installation of security measures (mainly chain link fencing and parking restrictions) were limited in scope and were not successful in deterring protesters who targeted other businesses in the plaza. 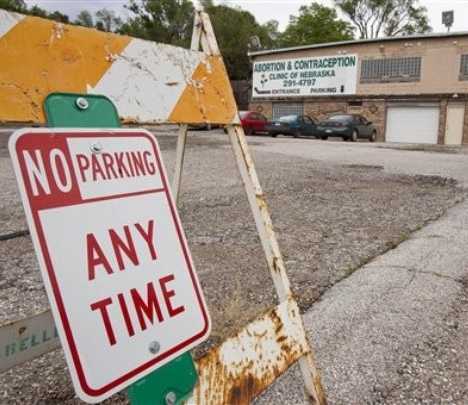 Frustrations built up and in 2000 owner & operator Tammy Sobieski’s lease was not renewed: Coldwell Banker (the property manager) explaining that both other tenants and patrons were not happy with the situation of daily protests conducted by pro-life groups. 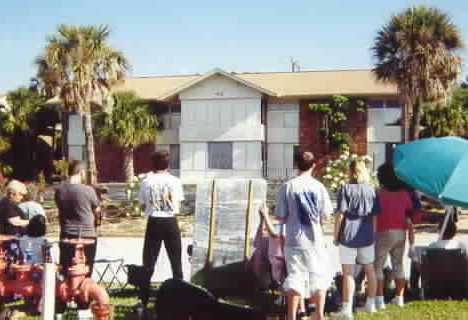 The new location of WomanCare in Cocoa (above) was a stand-alone building, which negated the use of certain pressure tactics by pro-life groups. Even so, the building was unsuited for its new purpose. Facing a busy street with wide lawns on either side, the building’s expansive windows all too often framed vocal protesters – an intimidating prospect for clinic staffers and patients. The frequent, noisy and colorful protests eventually were too much for clinic operators and the Cocoa location of WomanCare closed its doors on August 19th, 2005. 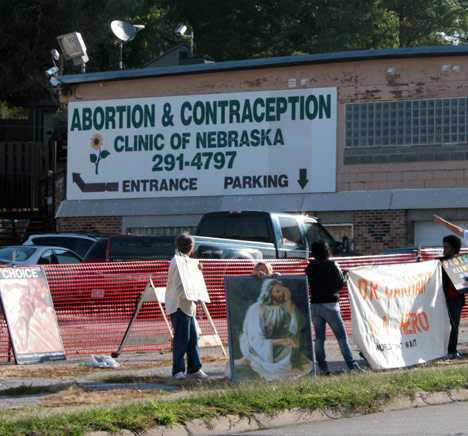 The Abortion & Contraception Clinic of Nebraska, located in Bellevue, is another family planning clinic that doesn’t beat around the bush… when it comes to choosing a name. Physician LeRoy Carhart has been operating the rather rundown-looking clinic at the same location in Bellevue since 1985. As seen in the image below, the original building is basically unmodified except for shaded windows and the installation of security lighting and cameras on the rooftop. 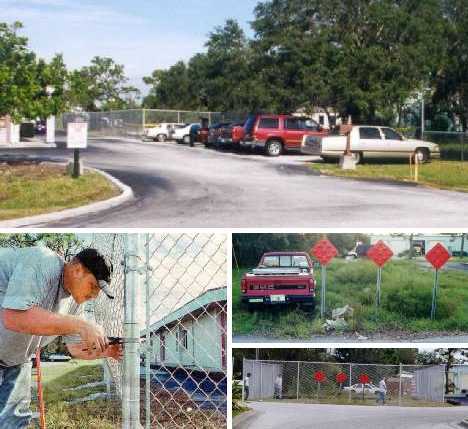 Fencing is of the temporary orange plastic mesh type typically used at construction sites. Carhart has not performed late-term abortions at his clinic because Nebraska’s more restrictive abortion laws effectively forbid them. 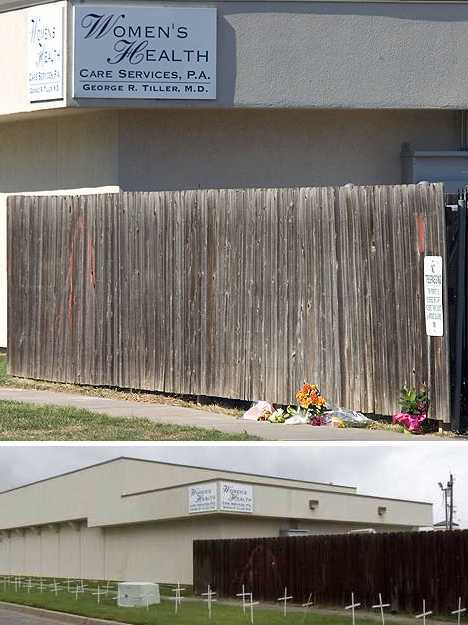 He had performed such procedures on his patients at George Tiller’s clinic in Wichita, Kansas, until Tiller’s murder led to the clinic’s closing. However, Carhart has stated that he may provide late-term abortions at his Bellevue clinic in an effort to accommodate patients who cannot access Dr. Tiller’s clinic – appealing to federal law over state law. If so, one would expect substantially more robust security and safety modifications to be made to the Bellevue clinic. Physical security can be expensive, and family planning providers must juggle those concerns with the overriding need to provide a welcoming environment for their patients. With that in mind, some smaller clinics that perhaps are not flush financially have opted for stealth instead of strength. A Jacksonville Women’s Health Center, in Jacksonville, Florida, is a perfect example. Lush foliage, subtle signage and a subdued gray, black & white exterior help the small clinic remain unobtrusive in its quiet neighborhood. Check out the building above – you wouldn’t know it just by looking, but this plain-jane red brick structure houses “Ohio’s most trusted abortion provider”. It’s the Cleveland Surgi-Center, which takes up the fourth floor of this multi-story medical office building located in south-central Cleveland, Ohio. 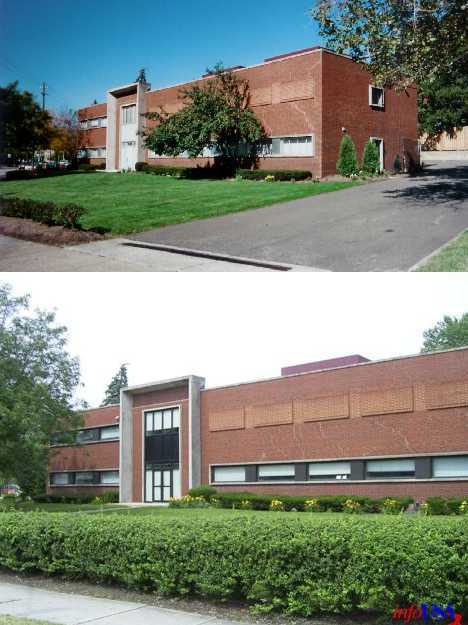 The two images of the building show minor cosmetic upgrades and the planting of a fast-growing hedge. Only a portion of the upper floor has windows facing the street, adding an extra dash of warehouse-style anonymity to this stealthy structure. 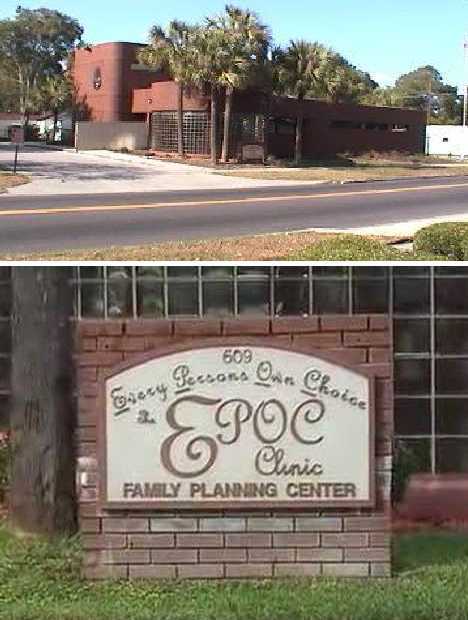 Established 1997, the EPOC Clinic Family Planning Center in Orlando, Florida, displays rounded exterior contours and stylish glass block trim that allows light – and ONLY light – to enter. A small grove of palm trees provides shade while helping the red-brown building complement its surrounding environment. Other windows in the building are wide but narrow, restricting visual access of the interior by anyone outside. 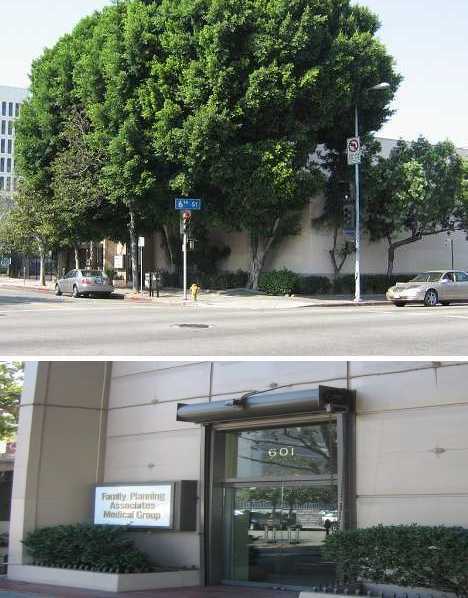 Family Planning Associates Medical Group (FPA) operates two abortion clinics in the Los Angeles metro area, including this location on S Westmoreland Avenue in the heart of downtown. The company itself dates from 1969 when abortion was legalized in California. At that time such procedures could only be performed in hospitals; it was not until the announcement of the Roe vs Wade decision that privately owned clinics were allowed to perform the procedure. 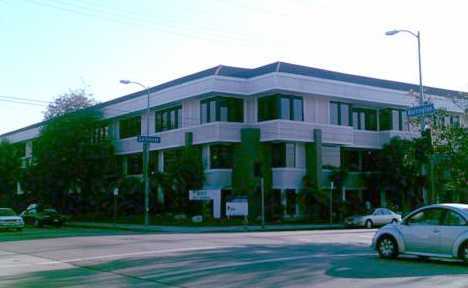 The FPA clinic at 601 S Westmoreland is one of the largest in Los Angeles but the building is difficult to recognize: lush, mature trees hug the pale gray walls, breaking up the building’s silhouette. It’s a “green” building – though not for the usual reasons. Contrast the overgrown look of the 601 S Westmoreland location with FPA’s other Los Angeles clinic at 2001 S Barrington Avenue. The latter has less vegetation though this may be because it’s a newer building. It’s also mainly free from fencing and bolsters, opting for a more open and accessible appearance. California’s generally more liberal society seems to be more comfortable with the concept of abortion and the fact that clinics can operate freely – at least, compared to the situation smaller clinics face in more conservative states. “The new Planned Parenthood Prevention Park stands as the largest Planned Parenthood facility in the nation,” according to Culturemap. 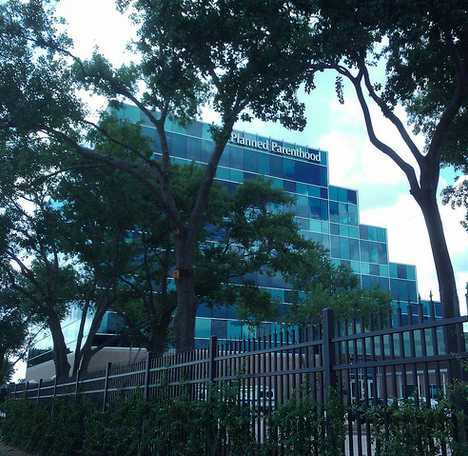 The $16.7 million facility that opened in May of 2010 is the new headquarters of Planned Parenthood of Houston and Southeast Texas. “It’s so much more modern and welcoming than the old location,” said Planned Parenthood’s Rochelle Tafolla, referring to what used to be a Brutalist concrete bank building. 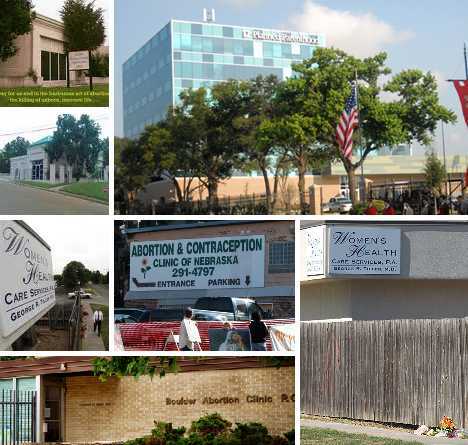 Pro-life groups are less enthusiastic, calling Planned Parenthood’s 78,000 square foot “Perverse Prevention Park” an “Abortion Supercenter” and “Abortions ‘R Us”. Planned Parenthood Prevention Park uses its size to full advantage, ensuring that potentially large demonstrations cannot choke off access to the building and that police and private security have plenty of room in which to contain and control crowds. 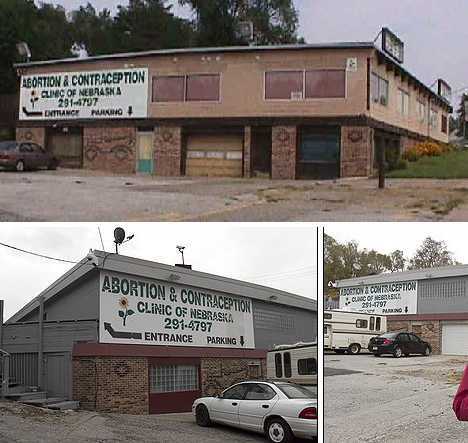 Says Rochelle Tafolla, “We were looking for something visible, centrally located and which provided a secure perimeter.” Tafolla also stated that about 93 percent of its services will be family planning, birth control and preventive health care – only 7 percent involve abortion. The question of abortion rights is an exceptionally divisive issue that has stoked passions on all sides to a fever pitch. This article has attempted to look behind and beyond political stances to focus on how clinics legally empowered to perform abortions and related family planning procedures since 1973 have responded to these challenges through architecture and design. As such, links to websites espousing certain positions on the issue of abortion have been referenced purely as sources of images and background information. Both this website and the author of this post are not associated in any way, shape or form with any such group.